Feeling like playing Disc Golf when I got up this am, I headed to McDonalds for my morning iced tea and got a mix of sweet and unsweet tea from the unsweet container. Ops someone made a mistake and I was going to go up to the counter and ask they fill it up from there container in the back when there in front of me was a line out the door waiting to be served. 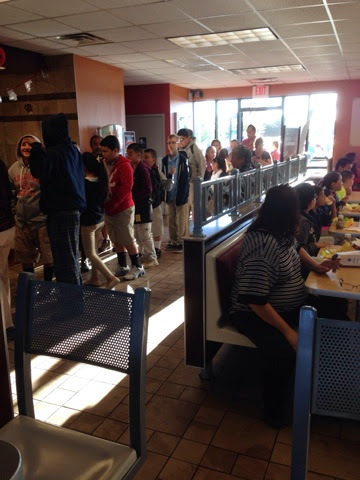 They were giving free breakfasts to children that caused this line. I left and went to another McDonalds on the way to Maranda Hard Rock Disc Golf and got my morning tea. I dislike sweet tea to say the least and will go out of my way to get what I want. When I arrived at the disc golf course there were a number of guys forming so I figured I only had a short time to tee off Snead of them. I hurried and teed off and being by myself, I was able to stay ahead. The day started off with no wind and after the 5th hole the wind was picking up so by the 16th hole I was seeing steady 10 mpg wind and gusts to 15 mph. Since some drives were protected and the fairways were open I got some interesting affects on my throws. One such situation I had a good throw and as it passed some trees the wind grabbed it and set it up and then up again keeping my disc sailing much further than I expected. As it goes I had the other affect at times where my disc would be carried left or right off course and even down. Made for an interesting game. 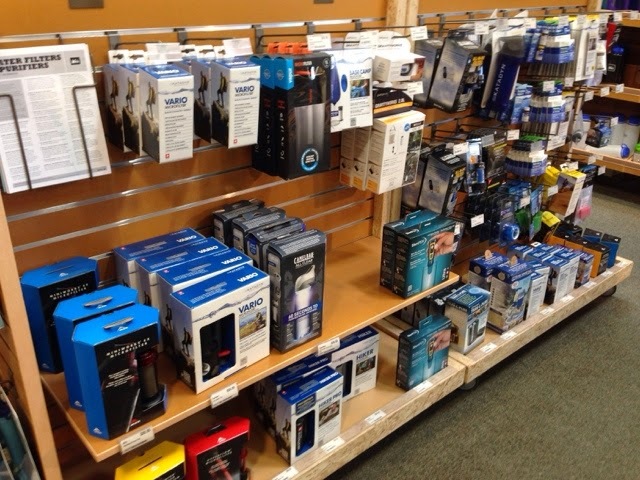 I had a 20% off coupon and a $9.00 dividend to REI so I was on that side of Tucson so I stopped over to look for a water filter. 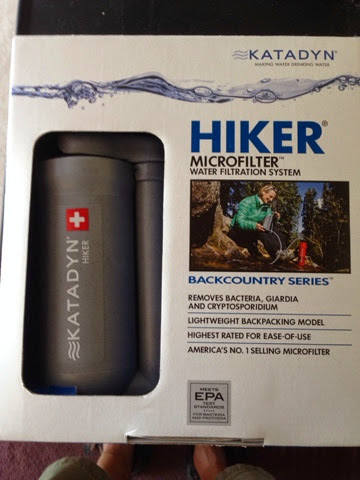 When hiking and there is water avsilable I can filter my own water rather than try to carry extra on the trail. This would ave worked great when I climbed Yosemite Falls as there was water on the climb and at the top but I lived without water having gone through my 2 liter Camelbak. I was dehydrated when I got back to the camper. This was not good. When I got to the store I needed to study all the models and features. As you can see this was an education waiting for me in this row. After reading all the pump model packaging, I focused in on one. Just them an employee came by and asked if I wanted any help and I agreed as I had questions. With the attendant's advice and what I wanted, I went with the unit below. It is a light weight pump with filtered pickup tube to a hand pump and output tube that can fill a bottle or Camelbak with a fitting. The filter is good for 200 gallons and this should be good for what I am looking for. 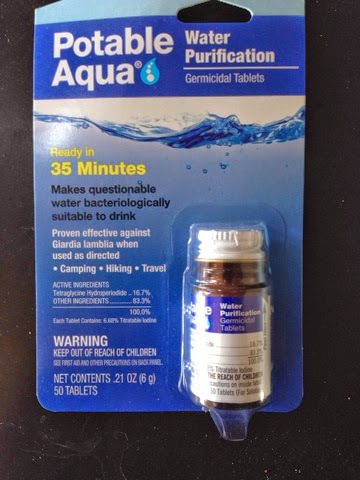 The attendant also suggested that if you want you can bring a coffee filter and put it over the pickup tube filter to help if there are a lot of particulate in the water. I also bought some new wattmeter tablets to have as well. After going to REI I went and did my laundry st the as no place I went last week. I'm front of this small strip mall is the same guy that was just sitting there last week. I went to Lowes parking lot for a half hour before going to Food City for my groceries and while in the parking lot I watched 3 young 20 something girls if average height and build, both with long blond hair. One with jeans the other in shorts, both with multiple tattoos. They were so called working the parking lot for money. I watched them with wonder what their story was. The tried to pick couples to ask but when they ran out of couples, remember this is the Lowes parking lot, they would ask men by them selves. One such man and woman encounter I could watch the man's body language and hand gestures. They left them with some story from the guy and no money. They then tried splitting up. Eventually they came to me and by then I was very interested in their pitch. The older of the two, (the one with jeans) came up to my passenger window that was open and the first thing I noticed was the poor quality of her teeth and that she was generally unkept. She told me that the other girl, standing about 6 feet behind her was her younger sister and they were thrown out of their apartment at 3:00 this am and her sister is 4 months pregnate. I looked over to her and she didn't have much of a waist so I guess it was possible. The older sister went on by explaining what shelter they are trying to get in but there is currently no room and doesn't want her sister in the street tonight and they are $16.00 short for a room for the night and also needed money for food. I gave her $5.00 and she said "God bless you." And they walked off towards Walmart that is across the side street. This was not my first encounter with the down and out and people on the fringe of society. Last night I gave Jim, the guy with the generator that I fixed, to Circle K. When I pulled up I was approached by a woman who wanted a ride to Nogales, AZ. She told me that she lives in Tucson and her car broke down and she has a terminally ill relative in the hospital in Nogales that she needed to get to. She wanted me to drive her there. I told her that has to be 85 miles to get there and I couldn't take her. I said to myself that it's not like needing a ride 10 miles. I explained to her that I was only going a mile away and she moved along waiting for the next car to stop by. This is a local store off the main road I19 and if I was looking for a ride to Nogales I would be at a gas station off one of the exits. I19 is only a mile away. A few days ago going into Walmart I met an obvious desperate young man in his early 20's with a young woman following come up to me and asked if I would give him $50 cash for $100 worth of food stamps. I told him I couldn't help. At the road entrance to Walmart on the same visit was a late 20's woman with a boy about 10 years old sitting on the entrance curb with a cardboard sign asking for money for food. In McDonalds where I go each morning I saw a 20 something couple walking with hooded sweatshirts on as I pulled in the parking lot Sunday morning. I got my iced tea and they came in and he was guiding her by holding on to her elbow. She went to the woman's room and he followed and stood with the door open and his body half in and half out talking loudly to her with a voice of concern. She came out and he seated her and he ordered two breakfast meals. He ate his and she poked at hers. He lowered his hood to eat and she didn't. To me she appeared to have a bad Saturday night with drugs and was still stung out from using. I couldn't help think how are these two going to end up functioning in society being so young with such happenings. Although these are recent examples in Tucson, pick a city and I have encountered such things where I have traveled. I have been sharing all these nice places I have been and fun things I have done, but there is another side of my travels I have seen. When talking to Denise about these things today she expressed concern about my welfare. She doesn't want me getting hot overbite head. In all cases I have not gone looking for people with problems, nor do I go to bad areas. These are not bad neighborhoods that I have run into such things. What bothers me is that there is enough of this out there that if I am not looking for it how much actually exists. I figure some peoples situations are real and others are just the way people live and get by. I have met some that are happy to just get by as they see no future for themselves. In thinking about Obsma Care most of these people don't have health insurance after the cutoff the other day as they can't afford anything and health insurance is not on there list of things that matter. On my trip I wanted to experience all the good that is out here and I have many examples of good things. I also have examples of the things that are not so good and have a better appreciation for societies problems, and have no idea how to fix them.